Current and former members of the club gathered at Mickleover Golf Club to celebrate the club's 20th anniversary. Inaugural member, Sheila Taylor recounted the difficulties in originally setting up the club and recalled a number of humorous anecdotes about the trials and tribulations of the formative days of the club. Current Club President, Sue Cook thanked the organising committee for organising the event, particularly June Green for decorating the room and tables in Rotary colours and also for organising the superb commemorative cake. 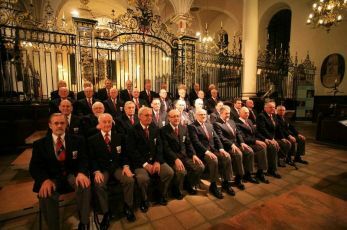 An excellent buffet was provided by the venue and a superb array of background music was supplied by member, Frank Pritchard. Sue raised a toast to the club and hoped that the club would remain healthy and strong for the next 20 years. 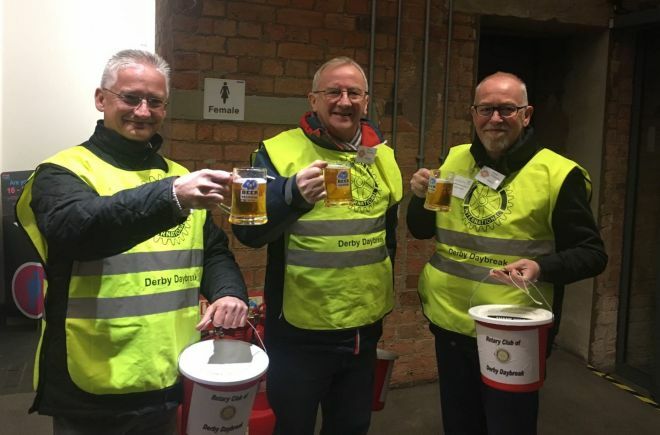 The Rotary Club of Derby Daybreak was honoured to have been chosen once again as one of the fundraising partners of the 15th Derby CAMRA Winter Beer Festival. With great delight, Derby Daybreak members, spent four fun afternoons and evenings with collecting buckets in the entrance to the Roundhouse during the course of the festival. Last year, generous donations helped to give a lifeline to local people with sight loss via sponsorship of RNIB talking book, to purchase new hydrotilt orthopaedic chairs and help toward cancer treatment. On behalf of the Rotary Club of Derby Daybreak, many thanks go to the organisers of the Derby CAMRA Winter Beer Festival and all donating attendees. The Club has raised £2,500 for the Royal National Institute of Blind People (RNIB). The money raised will enable RNIB to produce a new title for its Talking Books service, which provides over one million audio books every year free-of-charge to people who have difficulty in reading standard print. 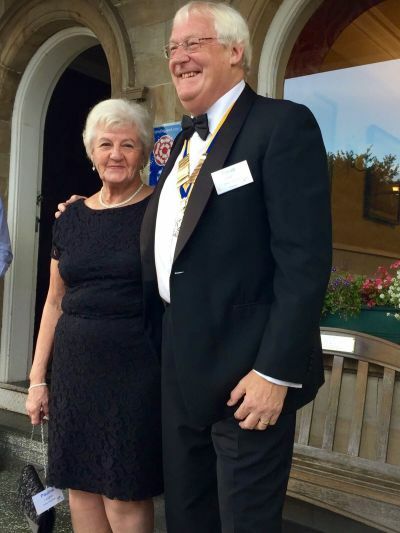 Club President, Sue Cook said: “Having previously worked with a local sight loss charity and seen the impact of sight loss on some of my family members, I learnt the importance of RNIB Talking Books through a talk at the Rotary Club. “We wanted to, in the words of RNIB, be part of offering ‘another voice in the house helping to break the silence and loneliness and open a window into a world of sight”. 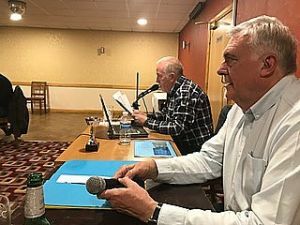 The Club raised money for an adult’s Talking Book by organising a variety of fundraising events, including a sports quiz, a collection at Derby Beer Festival, hosting an Indian supper at Spice Lounge, as well as a Christmas Fair. The book we have chosen to sponsor is Dead Ringers by Christopher Golden. Jenny Perry, RNIB Area Fundraising Manager for the East Midlands, said: “For over 80 years RNIB’s Talking Books service has created a lifeline to the outside world. “Thanks to the support of groups like the Rotary Club of Derby Daybreak, we can keep expanding our library, making sure people with sight loss don’t miss out on the joy of a good book. 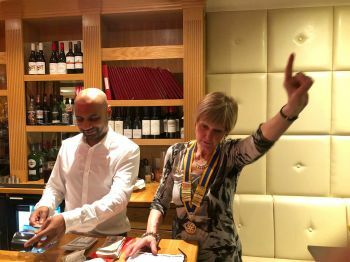 It was another great night of fundraising when members of the club gathered at the Spice Lounge in Derby to raise money to support the club’s own charities and the chosen charity of proprietor, Shah Rahman. 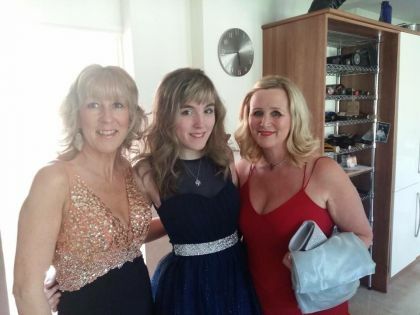 The evening raised £930 with the proceeds being equally split between Derby Daybreak charities and Birmingham Children’s Hospital Cardiac Unit. Many thanks must go to Club President, Sue Cook for organising the event and to Shah and his staff for creating a memorable evening. 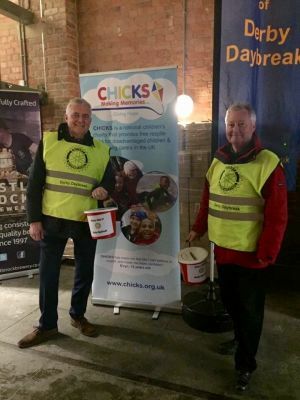 It was another brilliant four days of fundraising for the club at the 2018 Derby Winter Ales Festival, held at the iconic Derby Roundhouse from 21st to 24th February. Club members and volunteers manned the collection buckets throughout the whole of the festival and raised over £3,500 towards the club's main charities this year. The main recipients of our fundraising efforts are the Derby Hospitals DART Appeal (Radiotherapy equipment) and the Royal National Institute for the Blind (RNIB) Talking Books project. The following photographs show club members at their collection station. 70 guests attended the club’s latest fundraising venture, a Fun Wine tasting and Quiz which was held at St. Nicholas Church Hall, Allestree. 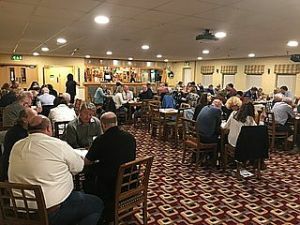 Organised by the accomplished and knowledgeable duo, John and Jackie Beswarick from the Rotary Club of Derby, guests enjoyed tasting eight different wines whilst answering questions about the origin, grape variety, strength and price of each. Complimenting the wines were an assortment of cheeses, paté, french bread, crackers and grapes, all of which contributed to a fulfilling and entertaining evening. 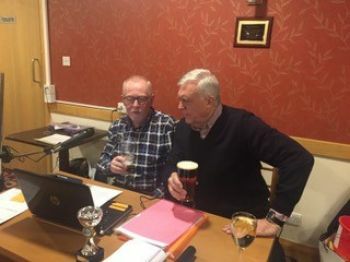 Representatives from the Rotary clubs of Derby and Bretby, also supported the event which when the final count is made, is likely to have raised almost £1,000 for local charities. A big ‘thank you’ must go to all our bakers who made such wonderful tray bakes, cup cakes, biscuits, gluten free delights, rocky roads, mars bar cakes, muffins, cornflake cakes and many more. We did a roaring trade for staff and visitors alike and everyone thoroughly enjoyed the morning, which raised £232 towards our charities this year. At the CHICKS Garden handover we were pleased to present cheques to our 2016/17 nominated charities. A cheque for £7,500 was made to our principal charity, the CHICKS Children’s Charity. 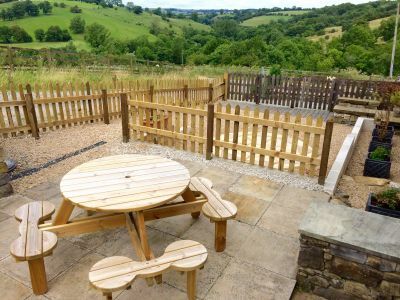 CHICKS is a fantastic charity that provides free respite breaks for disadvantaged children from across the UK, and has three holiday centres, including the Daleside Retreat near Ashbourne in Derbyshire. 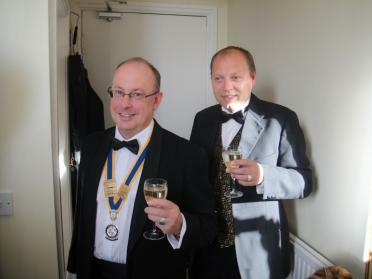 PHOTO: Immediate Past President, Dave Laughlin is photographed with CHICKS Regional Fundraising Manager, Matt Nickson. A cheque for £1,000 was made to Allan Shaw, Chairman elect of the Padley Group. PHOTO: Dave Laughlin hands over a cheque for £1,000 to Allan Shaw. 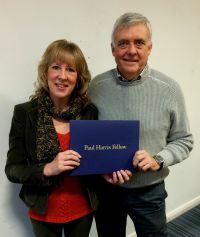 A cheque for £750 was made to Nathalie Walters, CEO of Safe & Sound. Safe & Sound have built a strong reputation as a key provider in the bid to end sexual violence, child sexual exploitation and abuse, and are trusted by victims of sexual exploitation, their families, carers and professional agencies alike. They provide support directly to children, young people and families in Derby and Derbyshire affected by the abuse and work to ensure that individuals receive the support they need to move forwards in their lives. 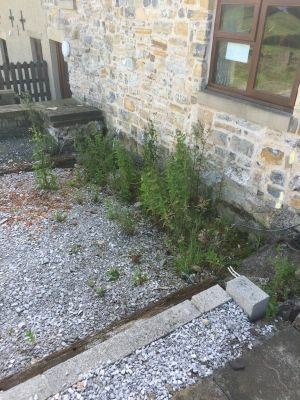 In addition to our fundraising efforts to support CHICKS, it was decided to embark on a service project to transform a number of previously unkempt and unloved gardens, which were inherited when CHICKS took control of the site. A great number of man hours from club members and volunteers together with the generosity of local companies and individuals resulted in a wonderful transformation of the gardens into modern, tidy and well designed areas that will be used equally by volunteers and children as areas for relaxation and enjoyment. After six months of endeavour, the Club was able to formally hand over the fruits of its labours on Sunday, 10th September. 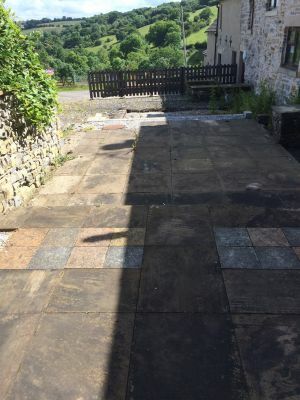 The following photographs show the gardens before the project started and the final results of the transformation. 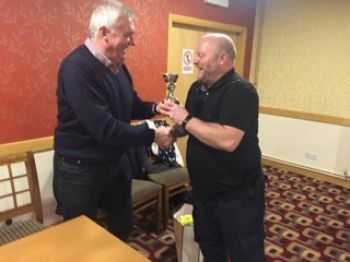 The 12th event in the pop quiz series was held at Belper Town Football Club where organisers Frank Pritchard and Steve Boxall masterfully engineered another superbly entertaining night. 14 teams took part in the quiz, the first half of which revolved around questions about artists and groups from each part of the British Isles. And despite claims that the questions would be easier this time, a few us struggled to stir the memory cells into meaningful action! A well-supported raffle topped off an enjoyable evening, which raised over £550 towards the club’s charitable causes. A gloriously sunny Sunday morning welcomed members of the club for a Sunday morning walk around beautiful Carsington Water. Throughout the 8 miles of the walk along well maintained pathways and cycle tracks, views of the shimmering waters of the reservoir were dotted with sailing boats and people making the most of the superb spring weather. 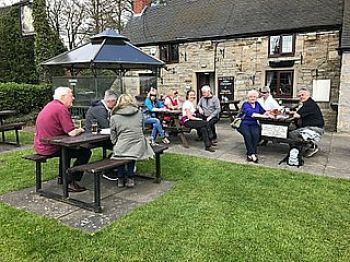 After two half hours of the invigorating walk, members retired to the Knockerdown Country Inn and Restaurant for well deserved liquid refreshments and an enjoyable Sunday lunch. 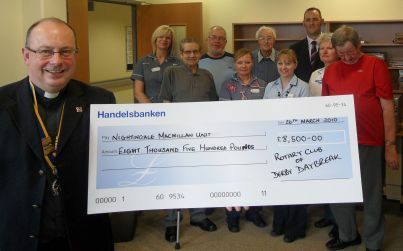 Friends of the Royal Derby Hospital were also taking part in a sponsored walk on the same day, so a donation was made to Ward 304 to help with their efforts to improve amenities for patients. In support of the CHICKS Children’s Charity, the club organised a St. Patrick’s Night charity dinner, which was held at Belper Town Football Club on Friday, 17th March. Attended by over 80 people, the guests were enthralled by Steve Judge, an inspiring individual who defeated personal adversity and major traumatic injuries into becoming a world champion para-triathlete. What a story and what a guy! Alfie Moore was next to delight the audience with his memories and humorous stories from his time as a police officer on Humberside. He had the guests splitting their sides at some of the anecdotes from his life with the boys in blue. Music was provided by the exceptionally talented Extreme Cello, who ended their set with a fantastic rendition of ‘Danny Boy’ – just perfect for the evening ahead. 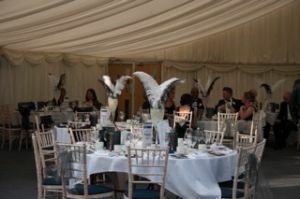 With a superb Irish themed thee course dinner provided by Derbyshire Catering, some impromptu singing from Mick Cox, and an excellently supported silent auction and raffle, the evening raised nearly £2,700 for CHICKS. Thanks must go to Matt Nickson, Izzy James and Jenny Cuadrado from CHICKS and Derby Daybreak Rotary Club President, Dave Laughlin for organising this splendid occasion. Also thanks to Belper Town Football Club for hosting the event and to Derbyshire Catering for the catering and bar service. Our combined efforts raised £5,013.90, predominantly for the CHICKS Children's Charity. This is a magnificent sum - and a record sum at this type of event. The 'returned glasses for charity' initiative was a spectacular success and there is no doubt that this was a huge contributor to our final total. We can all be incredibly proud of the commitment and loyalty of our members.so a big 'thank you' to everyone who helped with the collection and a special 'thank you' to Martin for co-ordinating the arrangements and liaising with the festival organisers. 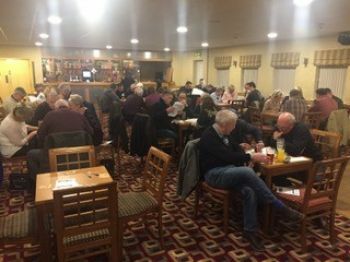 Club members and friends gathered at Belper Town Football Club to enjoy a Sports Quiz expertly organised by Frank Pritchard, Steve and Sue Boxall. 15 teams of four completed for a 'prestigious' trophy and following a keen contest, the winning team amassed 95 points out of a possible 124 - a great effort! The night was also a success on the fundraising front with over £500 raised towards the club's charitable causes. Members of the club attended the Rotary International District 1220, 45th Annual Conference at Scarborough on 30th September to 1st October. 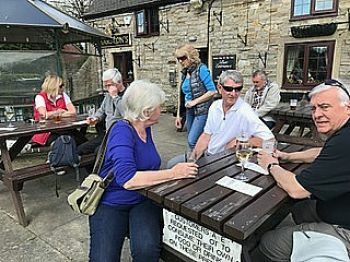 In addition to the diverse series of events and presentations that took place in the Scarborough Spa Centre, members also took time out to enjoy an relaxing social weekend, organised by Club President, David Laughlin. Rotarians attended the Conference Dinner in the Spa Complex and lost no time at all in getting their feet under the table, or in the following photo, on the table - enough said! 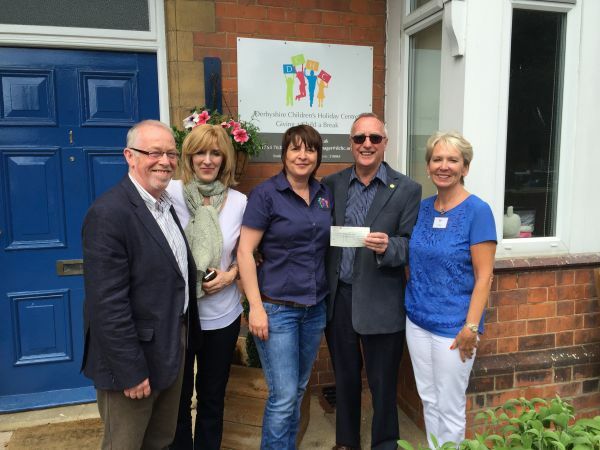 As a member of the Derby Daybreak Rotary Club, one of the main beneficiaries of our fund raising efforts is the very worthy Derbyshire Children’s Holiday Centre in Skegness. Over the time we have been supporting the charity I have got to understand and appreciate all of the valuable work they do in supporting disadvantaged children from across Derbyshire. In the main, they provide a week long break at their centre in Skegness for children who are experiencing difficult times at home. It gives the youngsters time and space to relax, make new friends and enjoy themselves in a supportive and structured environment and in the care of fully trained staff. 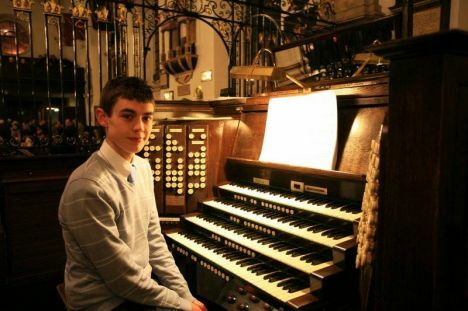 Recognised by the Local Education Authority as providing a Secondary Educational Experience as part of the overall education of the children who attend, it contributes to their personal and social development, giving them confidence and self-esteem, as well as providing memories that last a lifetime. in Derbyshire and have planned a series of fundraising events to mark the occasion, one of which is the Kilimanjaro Challenge. 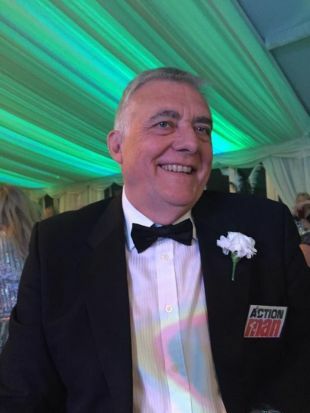 Having lived in Derbyshire all of my life and having many business connections across the county I feel it right and proper to support such a worthwhile charity in my local county. Together with a number of other like minded people, David will be climbing Mt. 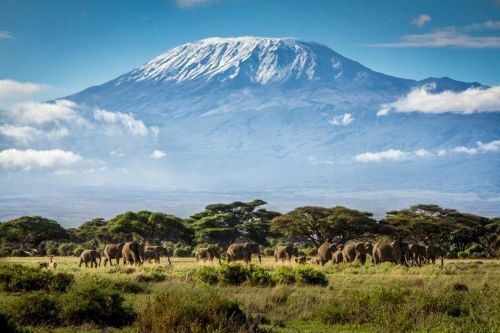 Kilimanjaro which at 5,895m high, is one of the largest volcanoes to ever break through the Earth’s crust and is the world’s highest freestanding mountain. He will be taking the Lemosho Trail to the top which starts in Tanzania and finishes 7 days later at the summit. How will the money you raise help the charity? The charity wants to help even more children, in today's society where the needs are acknowledged to be as great if not greater than when it was set up. It is currently able to give 450 holidays a year but receives annually in excess of 600 referrals: children in desperate need of a holiday, the majority identified by schools and social services. Many have suffered abuse and neglect: others come from loving, caring families who are simply currently experiencing difficult circumstances through no fault of their own. The charity’s aim is to secure enough funding to build a reserve that will allow it to increase the available holidays to 700 a year. That will need an extra £170,000 a year which is a big ask but the charity’s stature has grown and grown and there is confidence that it can be done. Club members paid a visit to Derbyshire Children’s Holiday Centre in Skegness, taking with them a batch of clothing for use by children who stay at the Centre. DCHC is a charity which was established in 1891 to provide Derbyshire children having troubles in their home lives with a holiday. At the present time, it provides 450 holiday places per season. Many children arrive with very little clothing and often the clothes they do have are too small or not suitable. A free shop is available to all of the children who visit for a holiday to select clothes of their choice and the children are allowed, at the house manager’s discretion, to take the clothes they need home with them. We are now collecting toiletries, pencils etc as well as more clothes which members will be taking to the home in October. 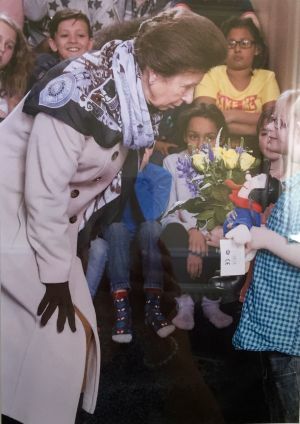 This is has been a special year for the Centre as they are celebrating their 125th year with their events crowned by a visit from HRH Princess Anne earlier this year. One of the rooms for the boys is themed Desert Storm - so the decor is themed accordingly. The other room for the boys are football themed and incorporate Derby County FC photos and they even have Rams duvet covers on the beds. The girls’ rooms are pink ballet themed with artistic decorations on the walls. They also have a bucking rodeo in the gymnasium. The club has been proud to make cheque prenetations to its chosen charities at the end of President, Gail Cox's year of office. 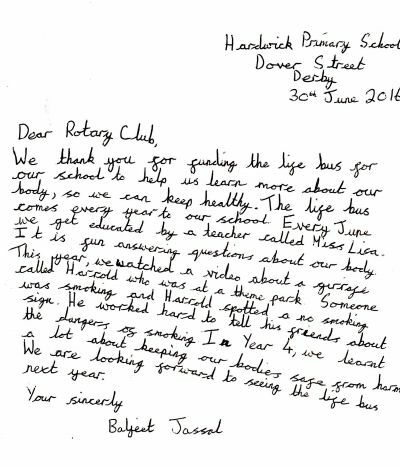 In conjunction with the Rotary clubs of Derby and Derby South, the club jointly funded a visit from a Life Education Bus at Hardwick Primary School in Derby. Years 4 and 5 pupils enjoyed learning all about the human body and its functions. The session was linked to the PSHE Year 4 topic, “It’s great to be me” and the Year 5 topic, “Friends”. The children really appreciated the chance to learn about keeping healthy with Lisa using the wonderful gadgets in the life bus. Despite the torrential rain in Duffield, the Titan Music Festival featured seven different acts, including a twenty-piece choir and our very own Elvis. The weather never put a damper on spirits with the several marquees set up doing an excellent job of keeping everyone dry. We would like to say a huge thank you to all the acts who donated their time to perform for our guests for free. We would also like to say a huge thank you to Okra for supplying the festival with food free-of-charge, Marston’s Brewery for supplying a fully functioning bar and 3 barrels of Kaltenberg and Pedigree and Carlsberg for also supplying a barrel of their world-famous lager. We would like to extend our gratitude to all those volunteers that donated their time over the few days prior to the festival and during the event itself. It was safe to say the first ever ‘Titan Music Festival’ was a huge success as we raised just under £5,000, all of which is going to provide underprivileged children with access to sport, recreation and support. The club was delighted to sponsor the £5 Enterprise Project at Lees Brook School, Chaddesden by donating £400.00 to get the project up and running. Each tutor group is given £5.00 and they have to come up with a range of fund raising ideas to make the £5.00 grow. One of the main beneficiaries of this Project was the Titan Children’s Trust, set up by local businessman Felix Frixou, who was a former Lees Brook student. The students rose to the occasion and duly rewarded the beneficiaries of the scheme, the Titan Children’s trust, with a significant return on the investment. The picture shows Joe McColgan, Director of Community Development at Lees Brook School looking on as one of the students presentis the cheque to Club President Gail Cox. One of the most impressive fundraising efforts of the year was the raffle for a Range Rover car. The car was donated by the Titan Children’s Charity, the main beneficiary of the club’s fundraising efforts during the current year. Tickets were sold at a wide number of events throughout the year, including the Derbyshire Christmas Food & Gift Fair, the Chatsworth Country Fair, Derby County football matches and a number of other club fundraising events. Nearly £12,000 was raised through the raffle, a fantastic effort by club members and only achieved through the generous nature of the people buying the tickets. The winning raffle ticket for thet Range Rover was ticket 0844 and the he lucky ticket holder was Christopher Balls of Ambergate, pictured above with Felix Frixou for the Titan Children's trust and club President, Gail Cox. The club hosted its 2nd Charity Spring Ball at Derbyshire Cricket Club on Saturday 14th May when almost 300 people attended a fabulous occasion which was held in support of the club’s charities, including the Titan Children’s Trust, the British Heart Foundation and Friends of the Royal Derby Hospital Baby Unit. 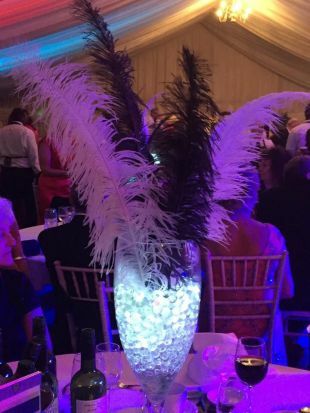 The event, which was staged in the stunningly lit cricket club marquee, provided a memorable night of entertainment, dancing and fun for everyone with a thoroughly enjoyable top-class meal that rounded off a perfect night. 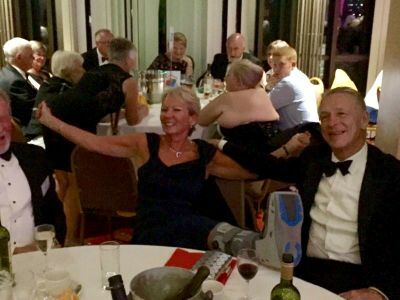 The generosity shown by our sponsors and all the people who donated our raffle prizes and auction lots was amazing and helped us raise an incredible £22,451 on the night. Special thanks must also go to club president Gail Cox and her organising team, who put on this fabulous night of entertainment. 9,000 people were killed and over 23,000 were injured by the earthquake that registered a magnitude of 7.8Mw on the Richter Scale. The earthquake also triggered an avalanche on Mount Everest; killing 21 people and making 25 April 2015 the deadliest day in history on the mountain. Hundreds of thousands of people were rendered homeless with entire villages flattened and with the prospects of more earthquakes to come, the country is in desperate need of relief funding. The club has agreed to donate a further £1,000 to New Futures Nepal to help the organisation to continue with its relief efforts in the country. 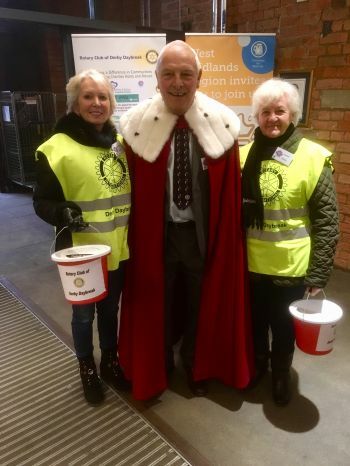 Club president Gail Cox thanked club members who volunteered to collect money at the National Winter Ales Festival held at the Roundhouse, Derby. 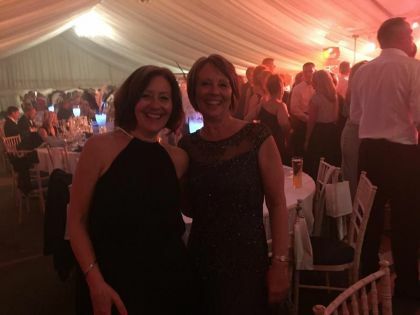 Gail commented, “We raised a total of £3765.29 - a fantastic result for our hours of aching feet, cold hands, shaking buckets and lots of laughs and banter. 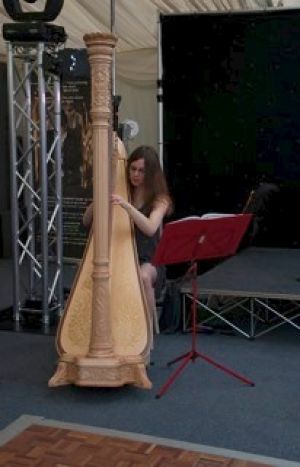 “This was a memorable end to our three years of collecting at what has been a great event for Derby”. 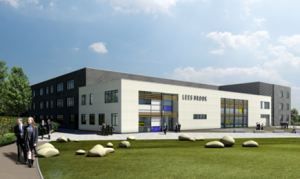 We have started to work with Lees Brook Community School to form closer community links between the club and the school. 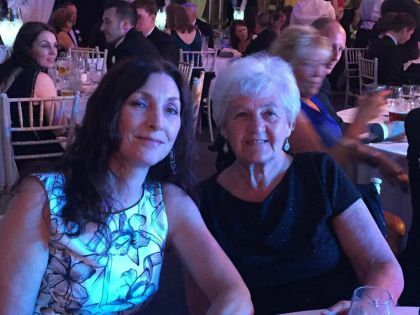 Our current President, Gail Cox is a former pupil at the school and during her year as President, one of her aims is to put something back into the school she attended for the benefit of our current students. As a result we have set up a joint Mentoring Programme for a small number of Year 10 students. The aim of the programme is to allow students to begin the process of looking ahead to what they would like to do in the future in terms of their further and higher education and possible career. Each student will be assigned a Mentor who is a member of the Rotary Club. The Rotary members come from a range of professional backgrounds in areas like the health profession, accountancy, property development, pharmacy, IT, animal care, hotel management and business owners. They all have a wealth of experience of work and life and have offered to share this with students to help them aspire to aim as high as they can in the future. It will be a wonderful opportunity for students to work with local people who have been very successful in their careers and businesses. The Club will also sponsor this year’s £5 Enterprise Project by donating £400.00 to get the project up and running. This is the third year the school have run this project, which raises money for local and national charities. Each tutor group is given £5.00 and they then have to come up with a range of fund raising ideas to make the £5.00 grow. One of the local charities that the project will support this year is the Titan Children’s Trust, set up by local businessman Felix Frixou, Managing Director of Benz Bavarian in Duffield. Felix, who is also a former Lees Brook student, set up the Trust to support disadvantaged children across the East Midlands by giving them the opportunity to access recreational and sporting activities as well as outdoor residential education. The Trust hopes to raise £1 million over the next 10 years to support these young people. 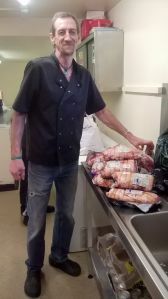 Members of the club organised a meat collection for the Padley Centre, a Derby-based charity founded in 1985, which delivers services to people with complex needs.to some of the most socially excluded people in the local community. These include people who are homeless, some with mental health or learing disability issues, drug or alcohol addiction, long-term unemployment, support for ex-offenders and those with needs related to rebuilding a shattered life. 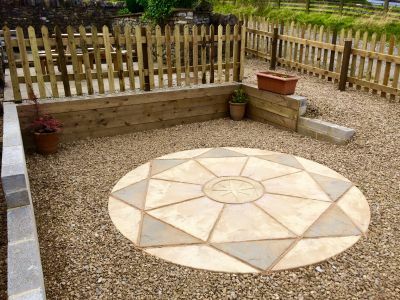 The Centre strives to support people struggling to move on from difficult pasts, working to build their self-confidence and allowing them to move on and grow. Padley also provides a safe environment for people who are at risk in society. The meat collection (pictured right) with one of the Centre's volunteer chefs will go a long way to provIding meals for those people who will be looked after by Padley over the Christmas period. November in the spectacular grounds of the National Trust owned Kedleston Hall, near Derby. With a Santa’s sleigh, a sing-a-long a Santa and raffle ticket sales for our donated Range Rover, we raised £853 towards our nominated charities. Although the weather was grim our volunteers remained in full voice and relatively dry and Santa and his little helpers did a great job despite our gazebo taking off in the high winds. It was with great pleasure that former Club President (twice), Steve Boxall was recently presented with his Paul Harris Fellow Award. 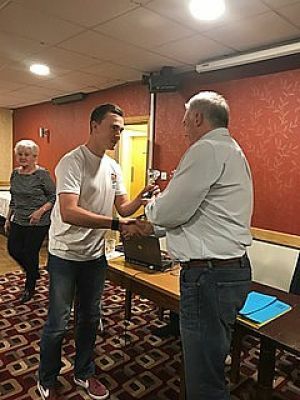 In presenting the award to Steve, President Gail Cox praised his outstanding service to the Rotary Club of Derby Daybreak and said that the award could not have been more deserving. 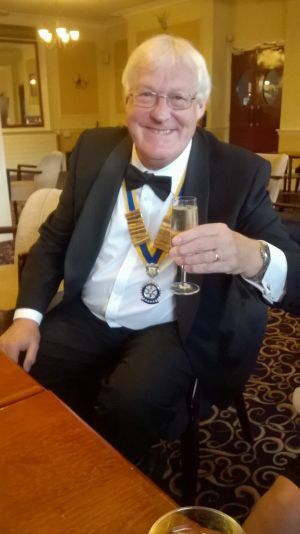 Steve is a founder member of the Derby Daybreak Rotary Club and has served the club unstintingly throughout his time with the club. 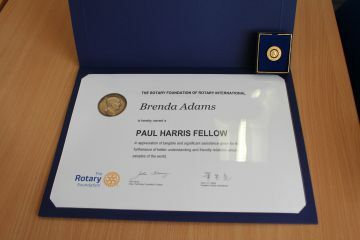 The Paul Harris Fellow Award is the highest honour a club can bestow on a person and acknowledges outstanding contributions made by individuals to the community, within and outside Rotary. Members of the Club were pleased to have been involved in fully renovating one of the kitchens at the Padley Centre, the Becket Street home of Derby’s leading homeless charity. With a generous donation of materials by Howden’s Joinery Company, Rotary member Martin Hough and Club President’s partner Mick Cox got to work on totally refurbishing the kitchen that was outdated and had fallen into a state of disrepair after 30 years of continued use. Their efforts were rewarded when the High Sheriff of Derbyshire, Oliver Stephenson, paid a visit to the Centre to present Padley with the Queens Award for Voluntary Service, the highest award given for voluntary services in the UK. 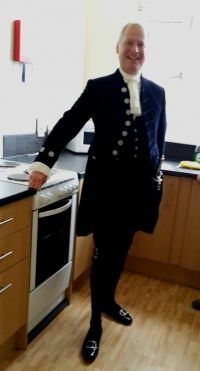 Whilst there, the High Sheriff formally opened the new kitchen and he commended Martin and Mick on their superb efforts to bring the kitchen up to modern standards. This was a great example of how Rotary can help organisations in a practical way rather than just in the usual fundraising areas. Menbers of the club attended the Rotary International District 1220 44th Annual Conference at Southport on 2nd-4th October. 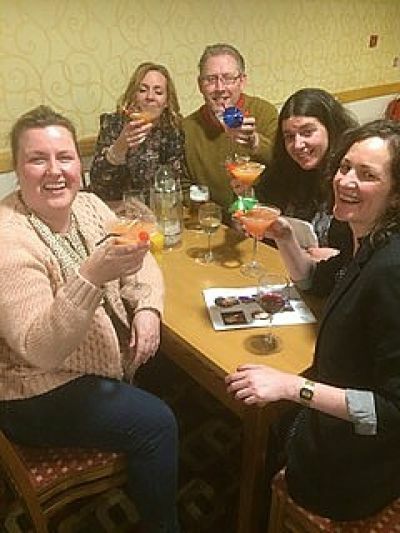 In addition to the fantastic series of events and presentations that took place in the Theatre and Convention Centre, members also took time out to enjoy a superb social weekend, expertly organised by Club President, Gail Cox. The highlight of the weekend was Rod Repton's spoof guided tour around Southport which resulted in him being apprehended by a colleague posiing as a Council Warden and requesting to to see his tour guide permit. Pandemonium followed as members either laughed uncontrollably to see his predicament or as they tried to intervene in the staged argument. The joke was on the members when all was revealed. President Gail said afterwards. "Thank you to you all for making our Southport weekend so enjoyable,memorable and unforgettable. The Rod & Alan Bandstand show is now touring Liverpool......not laughed so much in ages.....priceless". 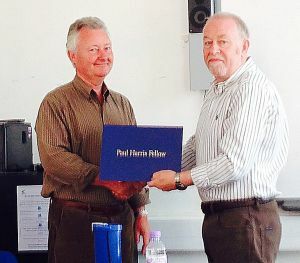 It was with great pleasure that at our meeting on 2nd July, our former club president, Clark Field was presented with the Paul Harris Fellow Award. 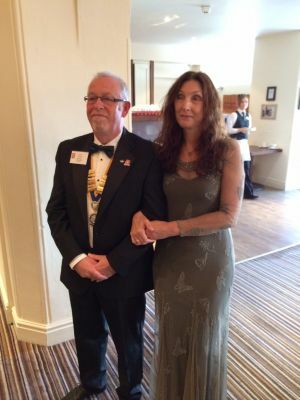 In presenting the award to Clark, immediate past President Frank Pritchard praised his outstanding service to the Rotary Club of Derby Daybreak and also to local and international charities for which he has worked tirelessly to raise funds and enhance the lives of those less fortunate. Members of the Club paid a visit to the Derbyshire Children's Holiday Centre in Skegness to hand over a cheque for £14,000, which will cover the food costs for the Centre for a whole year. It was a memorable day with the children at the Centre and even more so for those Club members who made the trip over tho the East Coast. David Harris, Fundraising Officer for the Centre, paid tribute to the work of the Derby Daybreak Rotary Club and to Club President Frank Pritchard, saying "Thanks for the wonderful donation and also please thank all of your members for all their hard work in fundraising over the past 12 months. "Also a special thnak you to you Frank, for your leadership and for adopting the Holday Centre as your main fundraising campaign during your presidency". Club President Frank Pritchard, Jinny Harris, Ali Bierley (Centre Manageress), David Harris (Centre Fundrasing Officer) and Brenda Adams with the £14,000 cheque. 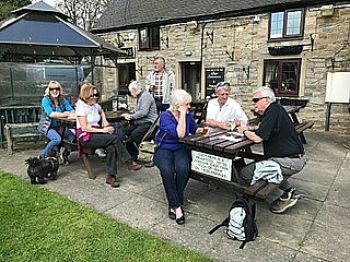 Members of the club enjoyed a 6 mile ramble across the beautiful Derbyshire countryside culminating in a fantastic Sunday lunch at the Okeover Arms. 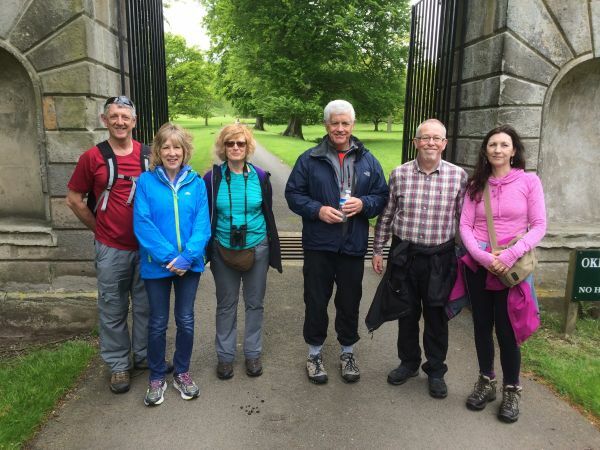 With the weather holding fair after an overcast start to the day, the intrepid walkers followed the path of the River Dove before crossing the county border into Staffordshire and climbing to reach the magnificent Blore Hall. 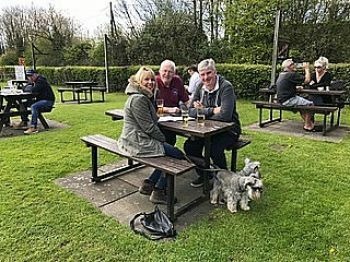 A gradual descent through the parklands of the Okeover estate, passing the Grade II listed Okeover Hall with its own church, the party returned to the Okeover Arms in Mapleton to share a well- earned meal and a pint or two of the local brew. 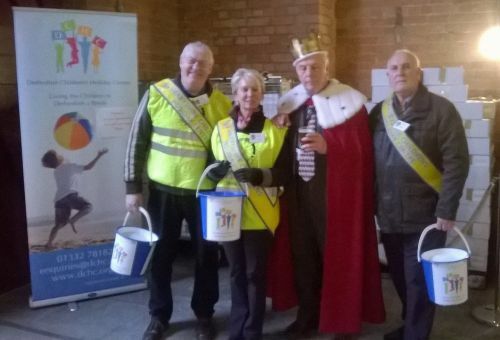 The club is thrilled to have raised in excess of £3,250 at the the 2015 CAMRA National Winter Ales Festival held at the historic Derby Roundhouse. Having been given the go ahead by the organisers for undertake a bucket collection for the second year in succession, the initiative proved to be outstandingly successful with the collection raising £3,255 for the club's 2015 nominated charity, the Derbyshire Children's Holiday Centre at Skegness. Club President Frank Pritchard expressed his delight at the level of money raised for the cause. "I just want to say a massive THANK YOU to everyone who came along and rattled buckets, cajoled the visitors, and kept the banter and camaraderie going throughout. "£3255 is a really significant amount of money, which will be going to a very worthy cause. Venue Cymru in Llandudno for a weekend of fun and fellowship, with excellent speakers, entertainment, food and the occasional tipple! Here are just a few of the images of a memorable weekend. 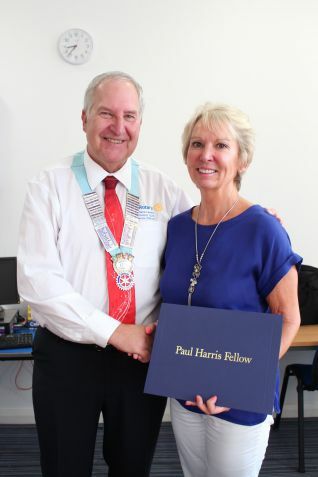 It was with great pleasure that at our meeting on 11th September, our immediate past president, Brenda Adams was presented with the Paul Harris Fellow Award. 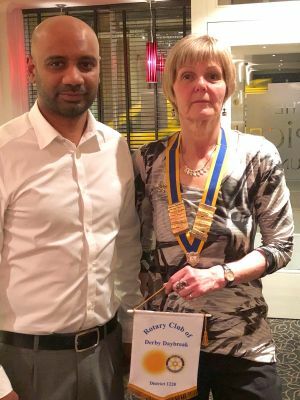 In presenting the award to Brenda, District Governor Steve Lawes praised her outstanding service to the Rotary Club of Derby Daybreak and to the local community. Taking on the Three Peaks Challenge, organising a charity ball and a challenge to turn £1 into £50 have all helped raise money for a new incubator at the Royal Derby Hospital. 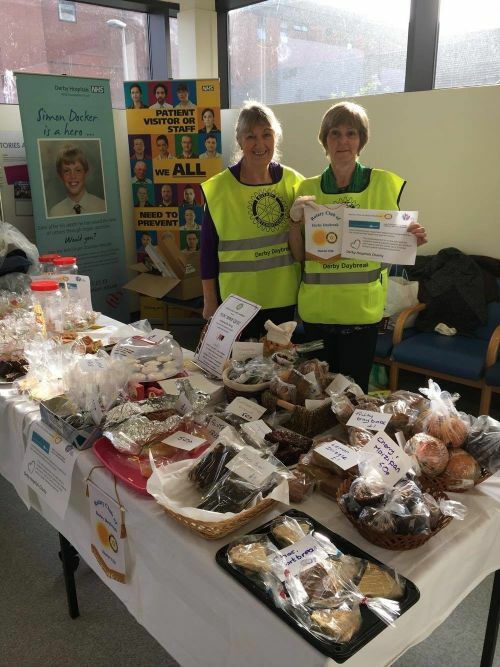 Members of the Derby Daybreak Rotary Club have spent the past year collecting money for several good causes, including Derby's Friends of the Baby Unit charity. 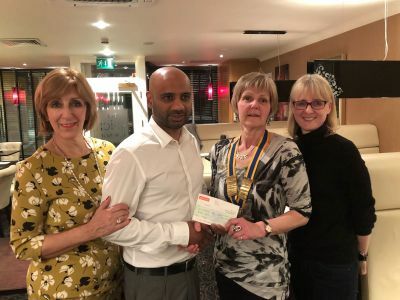 The good causes were selected by president Brenda Adams during her year in office and, over 12 months, members raised more than £30,000 - a record. 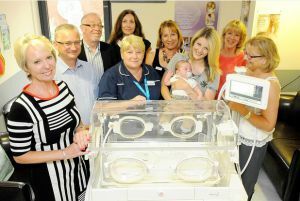 It meant volunteers at the Friends of the Baby Unit could use the money to buy the incubator for the neonatal intensive care unit at the hospital for £16,500. The rest has been split between Derby's Padley Centre, the Rotary International's End Polio Now campaign and the New Futures Nepal charity, which supports disadvantaged people in the south-Asian country. Outgoing president Brenda said: "Everybody really pulled together to raise this money and I think it's brought us closer together as a group. I was particularly impressed with the £1 challenge. Almost everyone managed to turn it into £50 and many raised much more. "Our incoming president, Frank Pritchard, managed to change his into £970 by going on BBC Radio 2's Popmaster quiz and getting sponsored for each point he scored. "We selected the Friends of the Baby Unit as one of our charities because there's been a fair few members over the years whose children were cared for there. 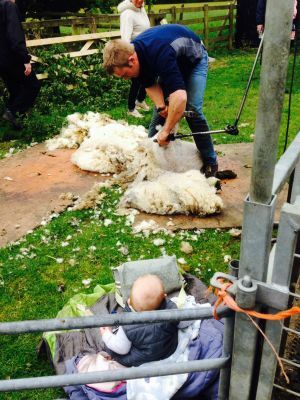 "I do remember people looking at me like I had two heads when I told them how much we had to raise for the incubator but everyone really rallied." 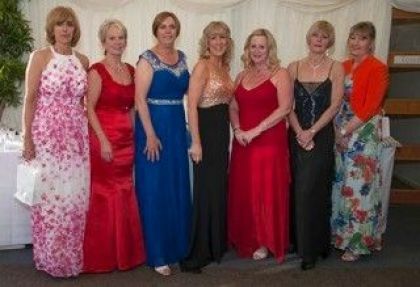 Other fund-raising events included the Baby Ball in May, while 15 members of the Rotary club took on the Three Peaks Challenge in June. Kate Repton, chairman and founder of the Friends of the Baby Unit, said there were about 10 incubators, including the new one, at the hospital. She said the charity was always grateful for donations for new incubators because, as well as wanting new ones, the existing incubators also need replacing when they become obsolete. Kate said: "We're delighted by the support from the Derby Daybreak Rotary Club because this is such an important piece of equipment. "There are so many charities out there, locally, nationally and internationally, which deserve support, so we are grateful to have been chosen. "The incubator is already being used and, when you see what a difference these pieces of equipment make to these babies' lives, you can understand how vital they are. Members endured an arduous sponsored climb involving scaling the peaks of Ben Nevis (14,455 feet), Scafell Pike (10,518 feet) and Mount Snowden (11,680 feet) in the space of 24 hours over the weekend of 21st and 22nd June. 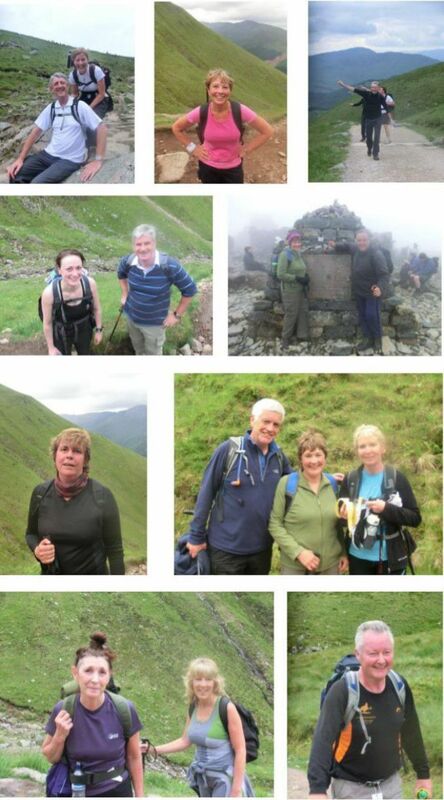 A montage of photographs of the climb are set out below. Derby Daybreak Rotary Club continue to support NEW Futures Nepal, a Charity Registered in the UK and based in Kathmandu, Nepal. Their Hope Centre is home to a growing number of disabled and orphaned children and young adults. 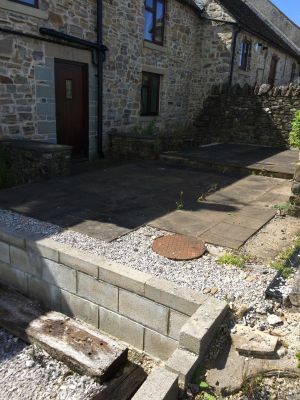 Funds raised by the club have supported ongoing improvements and maintenance requirements of the centre as well as the Sponsor a Child scheme. 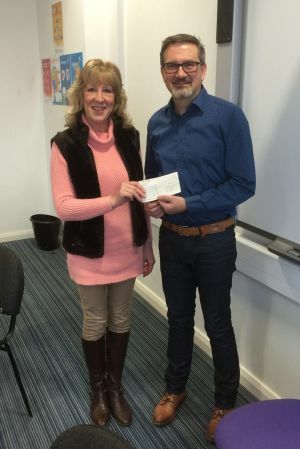 Andrew Small, a Director with New Futures Nepal, was presented with a cheque for £1,500 by President Brenda Adams at a recent club meeting. This will go to continue to support the education and well-being of Sabin Gurung under their Sponsor a Child scheme. This was the major fundraising event of the year. It was a terrific night to remember with guests enjoying a champagne reception and first class three course meal during which they were entertained by soloist Mitch Corner. After the meal, guests danced the night away to the sounds of the magnificent ‘The Roadsters. For those for which dancing wasn't their ‘cup of tea' they were able to try their luck at the casino tables. Spot prizes and beautiful ladies encouraged guests to spend their ‘Monopoly Money'. 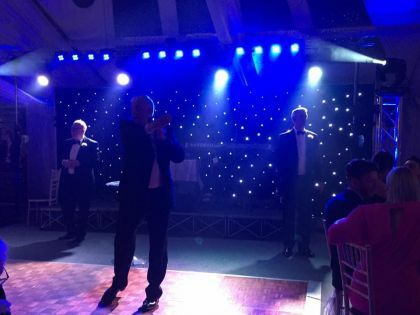 Over £12,000 was raised on the night - a truly remarkable achievement! Change given by thousands of people leaving the Beer Festival will help change the lives of new born babies in Derby. Thanks to the generosity of many of the people attending the National Winter Ales Festival held at the Roundhouse Derby Daybreak Rotary Club received a welcome contribution towards the cost of a new incubator. President Brenda Adams.‘We are very grateful to CAMRA and in particular the Festival organising committee for inviting us to be present throughout the Festival'. Kate Repton, Chair of the Friends of the Baby Unit at Derby Royal Hospital, said ‘We know that the additional incubator will be used by many of the babies needing support in the Neonatal Intensive Care Unit at the hospital. "We never expected to achieve this amount. It shows the generosity of a wide range of Festival goers for this great local cause, Cheers!" We received a cry for help from our member, Gary Spencer who is also a volunteer at the Padley Day Centre where they are completely out of socks! As the winter approaches a good supply of socks is ever more important. Therefore we decided that our local charity collection for September should be socks for Padley. Within a few days, over 100 pairs of socks were on their way to Padley! Start of updating and refreshing the news. 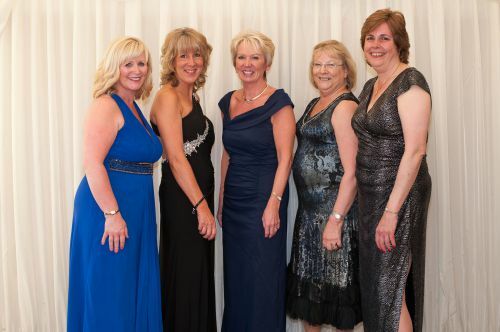 Fabulous 'Charioake' evening at Pride Park Stadium on Friday 9 July 2010. 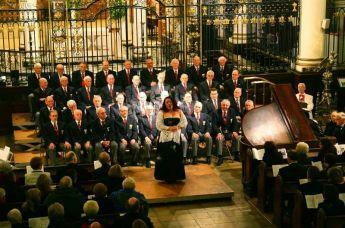 250 people enjoyed an amazing evening of music and good food and helped us raise over £3,600 for our charities. 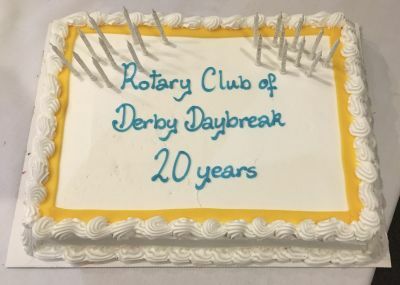 Nicky Smith has begun the new Rotary year promising a fun-filled year, continuing Daybreak's proud tradition of being 'a club with a difference'. (See 'This year's charities' and 'More about us' sections on this website). 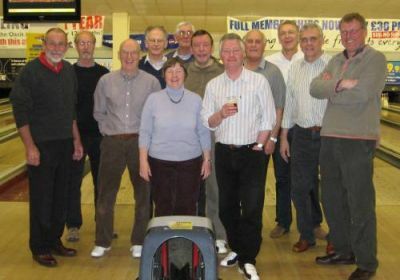 HISTORIC NEWS - Derby Daybreak wins the final of the District 1220 10 pin bowling competition! After a memorable match at Ilkeston on the 16 June against a very able team from Wirksworth, the six strong Daybreak team, supported by several cheerleaders, eventually emerged victorious by a good margin having been 3 points down at half-time! Special congratulations to Gil on his '3 strikes finale'! Well done team! And thanks to to organisers and all who took part. We are very proud indeed to hold the trophy. Following the huge success of the charity concert at Derby Cathedral, President Cedric Blakey was proud to present a cheque for £8,500 to the Nightingale Macmillan Unit at the Royal Derby Hospital on behalf of the club. 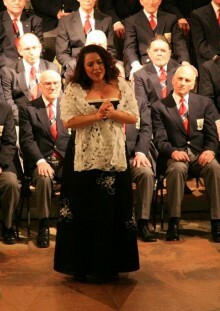 Many thanks for all who came to the gala Concert on 30th January 2010 with opera star Deborah Berioli and the Dalesmen Male Voice Choir. £7,936 was raised for the good causes - thank you to everyone who bought tickets, gave the raffle prizes and made other generous donations. A professional recording of Deborah Berioli's singing is available on CD ('Italian and French Art Songs' 16 tracks, songs by Scarlatti, Lotti, Gluck, Faure, Debussy, Bizet and others. With pianist Thomas Carlo Bo. Recorded in New York, 2009) £10 each. Email c.blakey@btinternet.com if you would like a copy . President prepares to go into the fray. Attended by over 80 people, the guests were enthralled by Steve Judge, an inspiring individual who defeated personal adversity and major traumatic injuries into becoming a world champion para-triathlete. What a story and what a guy! Alfie Moore was next to delight the audience with his memories and humorous stories from his time as a police officer on Humberside. He had the guests splitting their sides at some of the anecdotes from his life with the boys in blue. Music was provided by the exceptionally talented Extreme Cello, who ended their set with a fantastic rendition of ‘Danny Boy’ – just perfect for the evening ahead. With a superb Irish themed thee course dinner provided by Derbyshire Catering, some impromptu singing from Mick Cox, and an excellently supported silent auction and raffle, the evening raised nearly £2,700 for CHICKS. Thanks must go to Matt Nickson, Izzy James and Jenny Cuadrado from CHICKS and Derby Daybreak Rotary Club President, Dave Laughlin for organising this splendid occasion. Also thanks to Belper Town Football Club for hosting the event and to Derbyshire Catering for the catering and bar service. 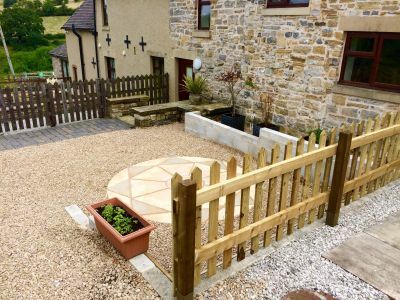 Our principle charity during the year was CHICKS, a fantastic charity that provides free respite breaks for disadvantaged children from across the UK, and has three holiday centres, including the Daleside Retreat near Ashbourne. 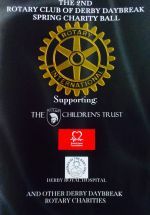 Copyright © 2009 - 2019 Derby Daybreak Rotary Club. All rights reserved.